I worked as a nurse for many years prior to retraining as a Certified Esthetician. Since 1986 I have owned and managed my own business, Chez Kathleen. With my interest in advancing the profession, I took on an active role as President of the Society of Ontario Electrologists. During this time my focus was on lobbying the government for licencing and effected health and safety regulations to protect both the client and the esthetician. Higher safety standards and advanced education levels resulted. 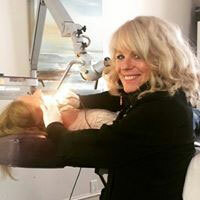 I have always had a keen literary interest and took on the role of writer and Editor-In-Chief for an estheticians trade magazine called Esthetics The Magazine. This magazine focused on education for Estheticians Canada wide. Education continues to be a major focus of mine ensuring I am always keeping abreast of the latest in the field for my clients. In more recent years I have focused on Permanent Make-up and Non Surgical Face Lifts (Dermatude). This year I changed my business name to Transform Esthetics, which describes better what I do. Removing facial hair permanently with Electrolysis, enhancing or creating features with Permanent Make-up and wiping away years with the non-surgical facelift, Dermatude Meta-Therapy. I love what I do and that is "Transforming" and enhancing individual beauty one face at a time. I look forward to working with you to make that happen.